One of the first things that should be done when debugging any client side issues with Office Communicator, Office Live Meeting, or the Office Live Meeting Outlook Add-In is to know what versions of each client the user is running. Rather than have the user open each application and do a “Help | About” and tediously record the version information for each client , I’ve developed a small and simple free online tool that retrieves the version of all three clients and displays it in an HTML window that can be easily cut-and-pasted into an email. Point your web browser to http://www.insideocs.com/Tools/ClientVersions.html and click the link to run it. There is also a link on the right-hand side of www.insideocs.com (under Inside OCS Resources). Attempts to display the installation source of Office Communicator (i.e. OEM, Evaluation Version, Volume License, MSDN, or Academic). 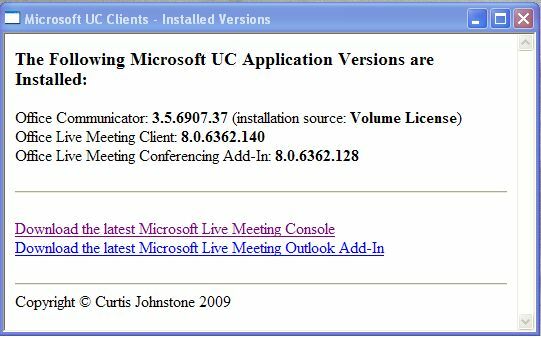 Contains links to download the latest Office Live Meeting Console and the Office Live Meeting Outlook Conferencing Add-In from Microsoft. Works for both 32-bit and 64-bit operating systems. Handy – makes life easier for diagnosing client issues over the phone. Rather than point the user at it, I would like to run this from my client and remotely gather from any machine.